Art can sometimes be a difficult subject to teach children. Unlike many other subjects that can be taught from books, art requires a much more hands-on approach. Children learn well by trying to do things themselves after receiving instruction or a demonstration. 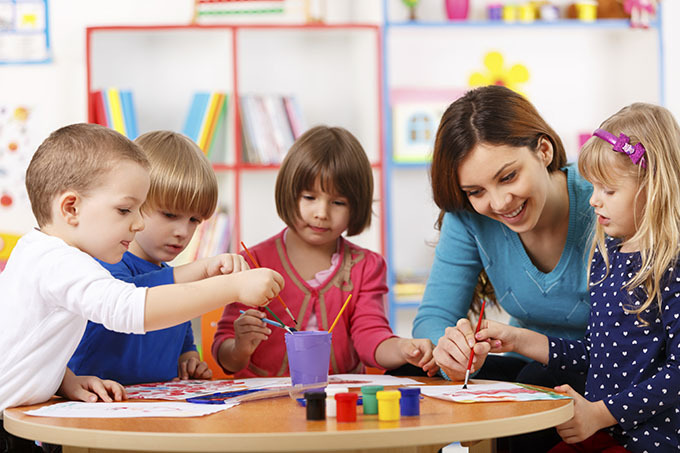 From a very young age, children can learn a lot from practicing different types of art, whether it is scribbling with crayons, creating a watercolor painting, paper mache, or a collage. Art is best known for its ability to enable people to express themselves through a safe medium. Apart from this, students also learn about culture and history by studying art from different countries or time periods. They may learn science and math principles by learning about elements such as perspective, color ranges, and geometry. Essentially, creating art is a way to develop a number of skills, imagination, and cognitive and interpretive abilities. It can teach students to develop discipline, control, and self-confidence, along with a healthy work ethic. As students continue to practice creating art, they will learn on their own what it takes to make an outstanding piece versus an inferior one. Art is also a wonderful way of bringing shy students out of their shell since it allows them to communicate their inner thoughts or feelings in a way that they may not normally be used to. Instead of isolating students, art can be used to bring them together to work as a team. When all of these skills are instilled early on, they remain with people well into their adult lives, helping to positively shape their abilities in relationships, careers, and life in general. There are many ways to structure an art class. For example, teachers could start a general discussion on a certain painter, style, or piece of art. As an alternative they could also ask students to research it themselves through a web quest. After studying a certain theme, it helps to get the point across more thoroughly by asking students to develop their own piece of artwork in the style that they just studied. Occasionally, a field trip can be organized to allow students to explore their surroundings or works by famous painters. This could be as varied as a trip to an art museum, or a sketching exercise that takes place at an outdoor location near the school. Keep in mind that students may sometimes become frustrated and discouraged if they realize that their work is not at the same level as their peers. Help them to get past this point by letting them know that art is essentially subjective. Further practice and extra help can assist in increasing their skill in art. Clare Tames is a self-employed freelance graphic designer, formidable cook, and avid reader. She written on contemporary and classical art in various print publications, and is just now beginning a writing career online. She works out of her home office in California, where her two children attend high school. Expect more from her at ArtsHeaven.com and around the web, and, if you like, drop her a line at her Google+ page!